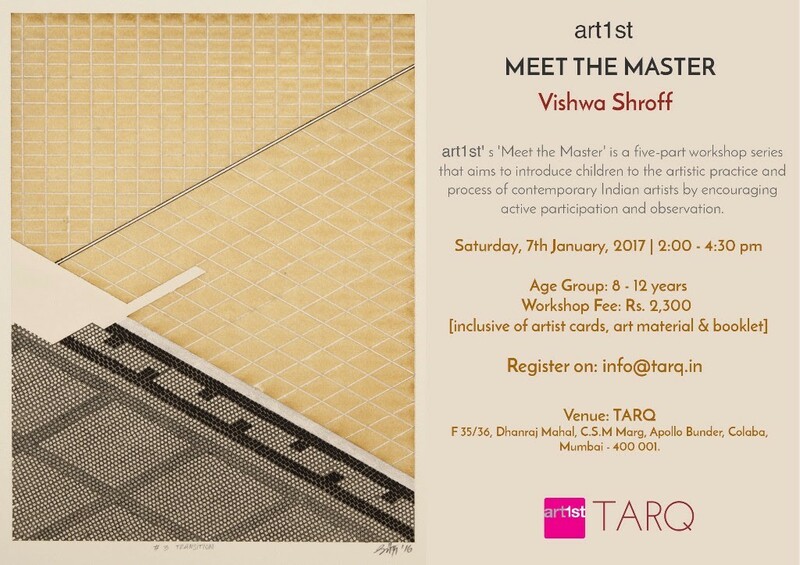 In conjunction with the ongoing exhibition ‘Drawn Space’ – a solo exhibition by Vishwa Shroff, TARQ will host the second edition of ‘Meet the Master’ – a series of workshops for children aged 8 – 12 years conducted by Art1st. 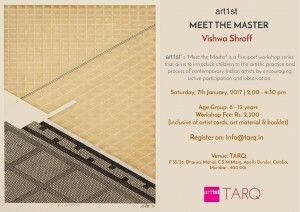 The workshop series aims to familiarize children with the work and lives of contemporary artists. It does so by engaging them with the narratives and practices of the artists. Vishwa Shroff’s work is an intersection between art, design and architecture. She has worked extensively with the format of a book, engaging with it both in terms of its formal composition as well as its conceptual implications. Her preoccupation with the ‘book’ has been a significant and common thread through her ouvre. Earlier this year, her scholarly engagement with the subject manifested in the form of an academic piece – ‘Duality in Drawing’, which she co-authored with Katsushi Goto for the International Symposium of Architectural Interchanges in Asia (ISAIA). Shroff lives and works between Mumbai and Tokyo. The exhibition continues till January 14. Founded in 2009 by Ritu Khoda, Art1st strongly believes that art can create personal transformation because it is only the individual who has the power to transform the self. At Art1st, we are working towards creating a paradigm shift in teaching by encouraging a fresh pedagogy. Learning through Art is about building a strong foundation for children so they can learn to trust and ‘own’ their ideas, empowering themselves with powerful expressive and thinking skills. Once entrenched as a part of their repertoire, they will carry forward their original thinking in every sphere of their lives. We use various instruments of the arts, life experiences and technology to induce a culture of transformative thinking and collaborate with the young thinkers, artists and local community, to fuel innovation and the creative quotient of the society we live in.